If you've been reading this blog for quite a while, then you'd probably know that I'm a big Japanese food lover. So when I got the chance to try out Moshi Moshi, a new Japanese fast food at Katipunan, Quezon City, how can I skip the trip. I've eaten in a lot of Japanese food establishments -- full service restaurants, cafés, fast food chains and even in kiosks. And among those I've already tried, I can definitely say that Moshi Moshi has one of the most hip and refreshing ambiance. With hues of green, cream and white, this Japanese fast food didn't fail to give a good first impression. For a fast food restaurant, Moshi Moshi was also really spacious. All thirty of us, a combination of both bloggers and OpenRicers, got to sit comfortably in the vicinity. And if you think we got the whole place packed, you're definitely wrong. Even with a big group to feed, Moshi Moshi still managed to continue its regular operations. Like any other Japanese food spots, Moshi Moshi also has its own version of my favorite Miso Soup (P35). For something as inexpensive as this bowl, I was surprised at how good it tasted. 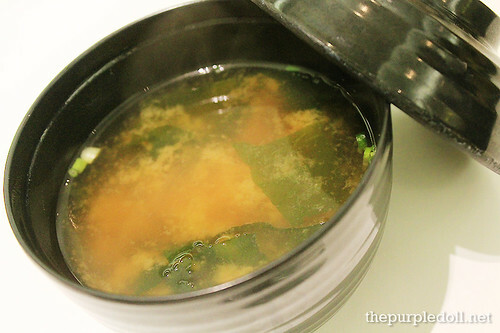 The blend of miso and dashi was harmonious, and there was a generous amount of both the tofu and wakame. We also got to try some side orders at Moshi Moshi like this 5-piece serving of Gyoza (P95) which I found quite small and a little flat. 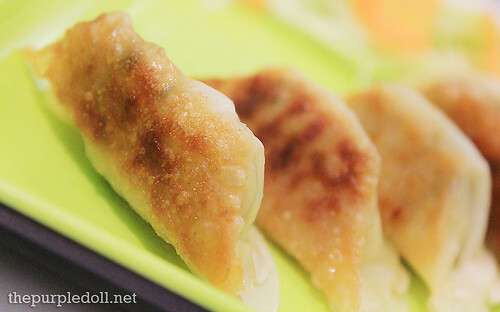 Although these dumplings were fried nicely, I found the meat fillings rather sad and dry. 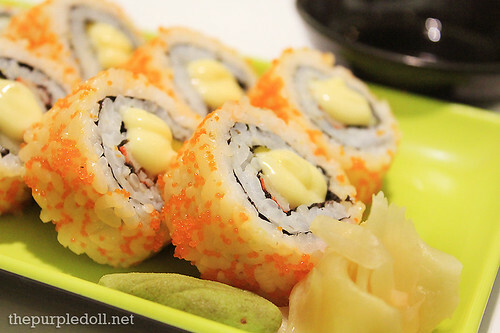 We also got to sample an 8-piece serving of the most popular Japanese maki in the country, California Rolls (P139). These rolls were quite good. The sushi rice was sticky enough, the mango slices used were sweet, and the added Japanese mayo definitely made the roll more flavorful. 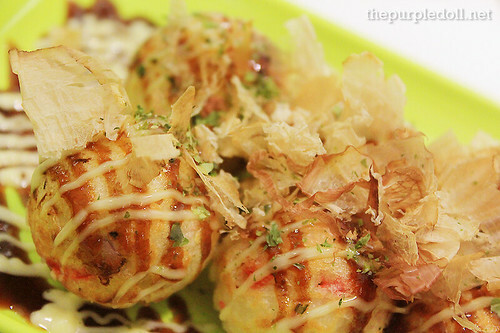 Moshi Moshi also had us try their 6-piece serving of Takoyaki (P55). Although this version of the famed Japanese street food was mostly made up of flour and only had little pieces of squid, the generous amount of Worcestershire sauce, mayo and dried bonito flakes made it quite enjoyable. 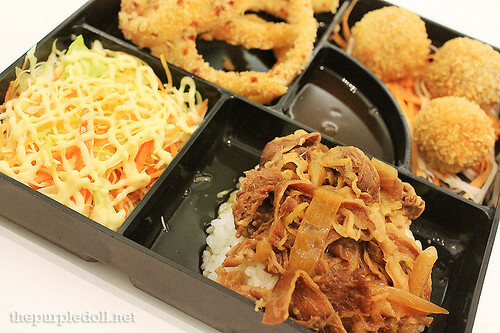 For the main course, we got to sample Moshi Moshi's Kin Deluxe Bento (P320). This boxed meal had stir-fried beef slices with rice, shrimp and sweet potato tempura, 3 pieces of takoyaki, a serving of kani salad and a fried egg. Although not as good as bento boxes from restaurants in Little Tokyo, as a hunger buster, this bento box will definitely satisfy a diner in need. As a sweet ending, we also got to try the ever famous Milk Tea (P55). 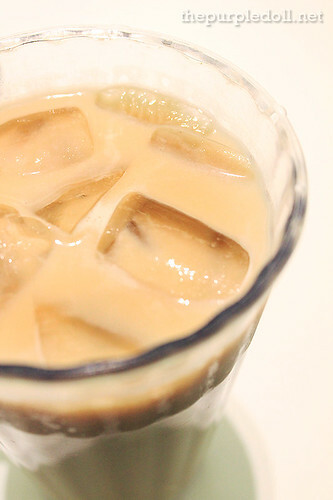 Unlike most milk teas I've tried though, Moshi Moshi's was too sweet for me and had a very distinct caramel taste. We also got to sample their soft serve Strawberry Ice Cream (P35) which was a nice meal ender. Aside from the regular line of dishes at Moshi Moshi, our group also got the chance to sample what will soon be added to the restaurant's menu. We got a preview of the line of Healthy Salads which will be offering diners with a Kani Salad (P188) and a Healthy Mix Salad (P255) enough to feed 10 people. 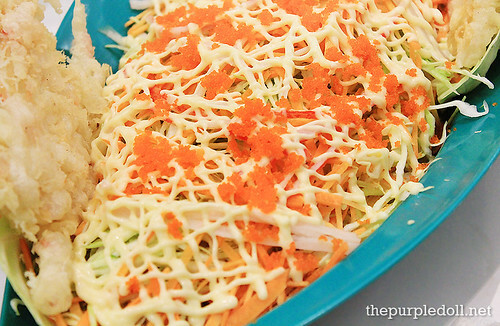 I'd definitely pass up on the Kani Salad as it only had a little of the kani strips. 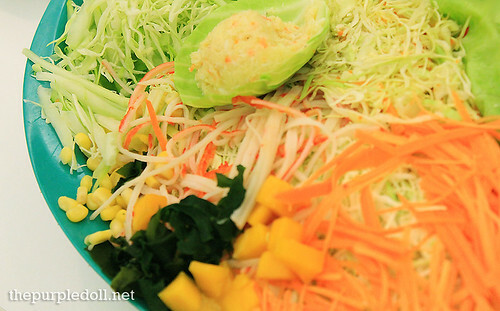 But I wouldn't mind trying the Healthy Mix Salad, a blend of strips of lettuce, cabbage, carrots, cucumber, kani, mangoes, wakame, corn and comes with your choice of dressing -- Chinese, Japanese, French or Sesame. 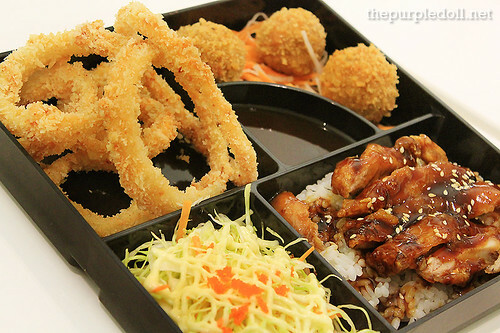 To give customers more liberty in choosing what dishes they want, Moshi Moshi will also be offering Create Your Own Bento (P155) where diners can choose a rice topping to go with the following sidings: kani salad, onion rings and chicken karaage balls. We got to make 2 of our own bento boxes -- a Gyu Bento and a Chicken Teriyaki Bento. Between these 2, I definitely preferred the one with chicken teriyaki as the chicken meat was tender and cooked in a flavorful teriyaki sauce. The sidings wasn't that bad too. The kani salad was the same as the big a la carte serving, the onion rings were fried to a nice crisp, and the chicken karaage balls albeit dry, were edible. For a fast food establishment, Moshi Moshi definitely fared well. 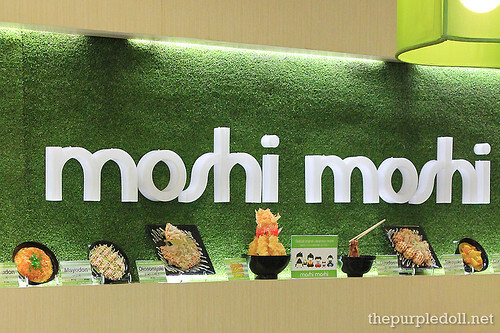 But as a general Japanese food provider, I know Moshi Moshi can still up its game and improve its dishes. However, although I was not entirely impressed with every dish I've tried, I'll still take a second trip to Katipunan to try their donburi (rice bowl) offerings, green tea shake and maybe grab a pack or two of their flavored KitKat. Wanna read more about Moshi Moshi? Ha! I like the chicken teriyaki bento. i am fan of takoyaki and miso soup. not really into california maki and gyoza. I really like green interiors. it's cozy and could make me comfortable immediately. The interior design doesn't look fast-food-y to me. Sometimes it's hard to believe when you say the food isn't too good. The photos you take make the food look yummier than they are. those are delightful bento boxes! we love anything Japa-nice too! I only wish they are not that expensive. Every two weeks or so, i buy a do it your self sushi maki set. We just add smoked salmon or crab meat, avocado, tofu and some more veggies yummy! I see this everyday when I pass by Katip to go to work. Been wanting to try it. I'm surprised that it's a fast food chain. All along I thought it was something like UCC. As expected, the food looks like something from Jap fastfood restos. Not really my type. When I eat Jap food, I want it to be good so almost often, I indulge in the higher priced restos. Thanks for sharing! Nag crave pa naman ako sa sushi ngayon gabi. Looking at these photos parang kumain na din ako. But I really need to visit the place. I feel out of place here. LOL! panalo ang shot....nakakagutom tuloy.....craving for jap food now. Love your photos! 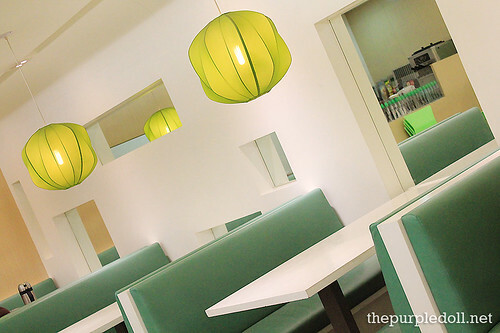 The place looks neat...how I wish we could visit Katipunan again! that deluxe bento looks so promising! do they have sukiyaki? that's my favorite! @Chyng: They don't have Sukiyaki eh. I think they won't have it soon din since they're a fast food resto. wow. moshi-moshi! i didn't know about that resto yet, their foods looks better than karate kid and tokyo-tokyo! The name of the resto sounds interesting. haha. 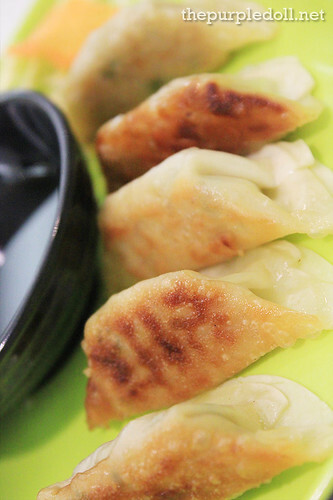 fave ko pa naman ang Gyoza at california sushi!! imfairness ka panalo rin ang ambiance si siya masakit sa mata!! oh, refreshing ambiance! not the typical japanese settings huh..
i miss japanese food, esp the cali maki and the sweetness of chicken teriyaki. that's why whenever we go to an asian buffet resto here i don't miss taking a few rolls of maki even if my tummy's really full. WOW Sumi! Now I have a reason to pick up my sister in ADMU, as I'll have further reason to frequent katipunan now. =) And must I say the prices are really affordable? Impressive yet! That looks so good. 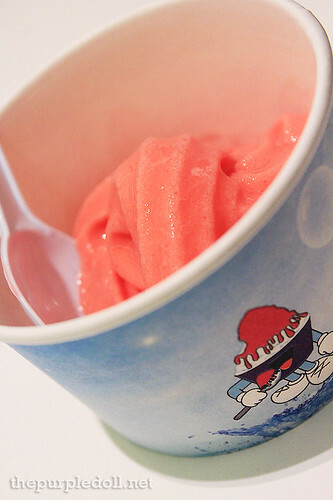 I could use some o f that strawberry ice cream right about now! The only Japanese food that I tasted was takoyaki. And I still wonder how those became so rounded. oh,my! the binto idea is pretty neat....the food looks enticing...yummy! I love the resto atmosphere..ganda kasi nang kulay! parang masarap ang mga pagkain diyan....thanks for sharing..
Everything looks good but ang layo nanaman from us! Hehe. I love Japanese food din except yung mga hilaw! hehehe! 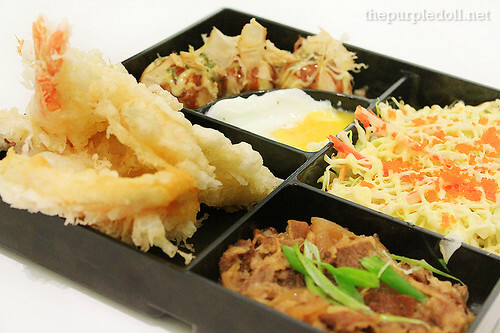 Oh, I love the concept of create your own bento :) I wish this was closer to home but I'll definitely try this out when I'm in the Katipunan area. The food in the photos really looks delicious but what surprise me are the prices of each items that you have indicated on this post. They are very cheap. If you happen to enter a Japanese restaurant in Brunei, you will also be amazed of the prices of the foods — very expensive. My kind of food joint! Totally craving now, hmmm will pick what to cook from what you presented here hehe. I like the fresh and clean look of the resto. Not a fan of Japanese food tho.